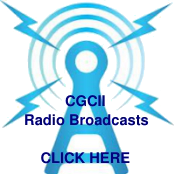 The Christ Gospel Broadcast is a weekly radio program of Christ Gospel Churches Int’l, Inc.® produced in Jeffersonville, and heard around the world in more than 135 countries. Unlike most religious radio programs, nothing is offered for sale, nor are any donations solicited. The programs consist only of Bible lessons and music. Letters arrive daily from such places as the Philippines, the Caribbean, Africa, Europe, Central America, and even Moscow, where one of the city’s most popular radio stations carries the program.